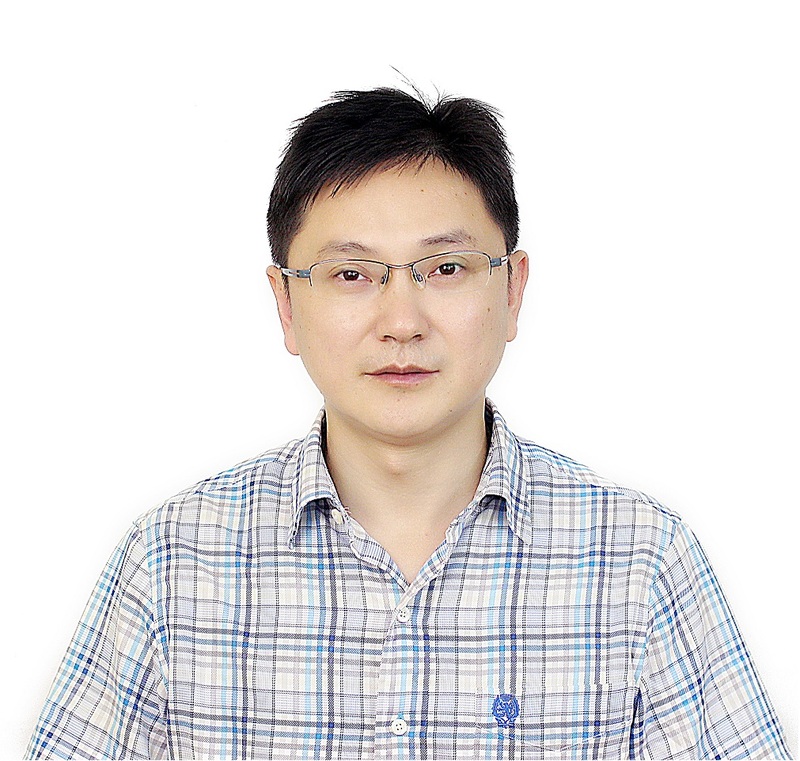 Weiwei Xu is currently a researcher at state key lab of CAD&CG in Zhejiang university. He was a Qianjiang Professor at Hangzhou Normal University and a researcher in Internet Graphics Group at Microsoft Research Asia from 2005 to 2012, and he was a post-doc researcher at Ritsmeikan university in Japan for more than one year. He received Ph.D. Degree in Computer Graphics from Zhejiang University, Hangzhou, and B.S. Degree and Master Degree in Computer Science from Hohai University in 1996 and 1999 respectively. This paper studies the structure of a deep convolutional neural network to predict the foreground alpha matte by taking a single RGB image as input. Our network is fully convolutional with two decoder branches for the foreground and background classification respectively. Then a fusion branch is used to integrate the two classification results which gives rise to alpha values as the soft segmentation result. This design provides more degrees of freedom than a single decoder branch for the network to obtain better alpha values during training. The network can implicitly produce trimaps without user interaction, which is easy to use for novices without expertise in digital matting. Experimental results demonstrate that our network can achieve high-quality alpha mattes for various types of objects and outperform the state-of-the-art CNN-based image matting methods on the human image matting task. In this paper, we develop a domain-decomposed subspace and multigrid solver to analyze the stress distribution for large-scale finite element meshes with millions of degrees of freedom. 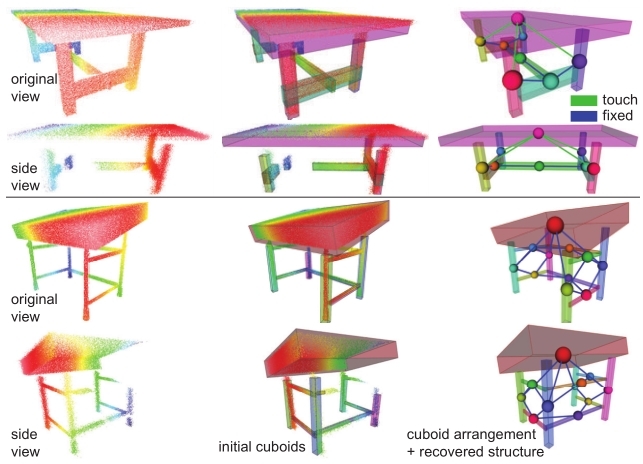 Through the domain decomposition technique, the shape editing directly updates the data structure of local finite element matrices. Doing so avoids the expensive factorization step in a direct solver and provides users with a progressive feedback of the stress distribution corresponding to the mesh operations: a fast preview is achieved through the subspace solver, and the multigrid solver refines the preview result if the user needs to examine the stress distribution carefully at certain design stages. Our system constructs the subspace for stress analysis using reduced constrained modes and builds a three-level multigrid solver through the algebraic multigrid method. We remove mid-edge nodes and lump unknowns with the Schur complement method. The updating and solving of the large global stiffness matrix are implemented in parallel after the domain decomposition. Experimental results show that our solver outperforms the parallel Intel MKL solver. Speedups of 50%-100% can be achieved for large-scale meshes with reasonable pre-computation costs when setting the stopping criterion of the multigrid solver to be 1e-3 relative error. This paper presents a spatial reduction framework for simulating nonlinear deformable objects interactively. This reduced model is built using a small number of overlapping quadratic domains as we notice that incorporating high-order degrees of freedom (DOFs) is important for the simulation quality. Departing from existing multi-domain methods in graphics, our method interprets deformed shapes as blended quadratic transformations from nearby domains. Doing so avoids expensive safeguards against the domain coupling and improves the numerical robustness under large deformations. We present an algorithm that efficiently computes weight functions for reduced DOFs in a physics-aware manner. Inspired by the well-known multi-weight enveloping technique, our framework also allows subspace tweaking based on a few representative deformation poses. Such elastic weighting mechanism significantly extends the expressivity of the reduced model with light-weight computational efforts. Our simulator is versatile and can be well interfaced with many existing techniques. It also supports local DOF adaption to incorporate novel deformations (i.e., induced by the collision). The proposed algorithm complements state-of-the-art model reduction and domain decomposition methods by seeking for good trade-offs among animation quality, numerical robustness, pre-computation complexity and simulation efficiency from an alternative perspective. We investigate how to obtain high�\quality 360�\degree 3D reconstructions of small objects using consumer�\level depth cameras. For many homeware objects such as shoes and toys with dimensions around 0.06 �C 0.4 meters, their whole projections, in the hand�\held scanning process, occupy fewer than 20% pixels of the camera's image. We observe that existing 3D reconstruction algorithms like KinectFusion and other similar methods often fail in such cases even under the close�\range depth setting. To achieve high�\quality 3D object reconstruction results at this scale, our algorithm relies on an online global non�\rigid registration, where embedded deformation graph is employed to handle the drifting of camera tracking and the possible nonlinear distortion in the captured depth data. We perform an automatic target object extraction from RGBD frames to remove the unrelated depth data so that the registration algorithm can focus on minimizing the geometric and photogrammetric distances of the RGBD data of target objects. Our algorithm is implemented using CUDA for a fast non�\rigid registration. The experimental results show that the proposed method can reconstruct high�\quality 3D shapes of various small objects with textures. Transferring deformation from a source shape to a target shape is a very useful technique in computer graphics. State-of-the-art deformation transfer methods require either point-wise correspondences between source and target shapes, or pairs of deformed source and target shapes with corresponding deformations. However, in most cases, such correspondences are not available and cannot be reliably established using an automatic algorithm. Therefore, substantial user effort is needed to label the correspondences or to obtain and specify such shape sets. In this work, we propose a novel approach to automatic deformation transfer between two unpaired shape sets without correspondences. 3D deformation is represented in a high-dimensional space. To obtain a more compact and effective representation, two convolutional variational autoencoders are learned to encode source and target shapes to their latent spaces. We exploit a Generative Adversarial Network (GAN) to map deformed source shapes to deformed target shapes, both in the latent spaces, which ensures the obtained shapes from the mapping are indistinguishable from the target shapes. This is still an under-constrained problem, so we further utilize a reverse mapping from target shapes to source shapes and incorporate cycle consistency loss, i.e. applying both mappings should reverse to the input shape. This VAE-Cycle GAN (VC-GAN) architecture is used to build a reliable mapping between shape spaces. Finally, a similarity constraint is employed to ensure the mapping is consistent with visual similarity, achieved by learning a similarity neural network that takes the embedding vectors from the source and target latent spaces and predicts the light field distance between the corresponding shapes. Experimental results show that our fully automatic method is able to obtain high-quality deformation transfer results with unpaired data sets, comparable or better than existing methods where strict correspondences are required. DeepWarp is an efficient and highly re-usable deep neural network (DNN) based nonlinear deformable simulation framework. Unlike other deep learning applications such as image recognition, where different inputs have a uniform and consistent format (eg an array of all the pixels in an image), the input for deformable simulation is quite variable, high-dimensional, and parametrization-unfriendly. Consequently, even though DNN is known for its rich expressivity of nonlinear functions, directly using DNN to reconstruct the force-displacement relation for general deformable simulation is nearly impossible. DeepWarp obviates this difficulty by partially restoring the force-displacement relation via warping the nodal displacement simulated using a simplistic constitutive model--the linear elasticity. In other words, DeepWarp yields an incremental displacement fix based on a simplified (therefore incorrect) simulation result other than returning the unknown displacement directly. We contrive a compact yet effective feature vector including geodesic, potential and digression to sort training pairs of per-node linear and nonlinear displacement. DeepWarp is robust under different model shapes and tessellations. With the assistance of deformation substructuring, one DNN training is able to handle a wide range of 3D models of various geometries including most examples shown in the paper. Thanks to the linear elasticity and its constant system matrix, the underlying simulator only needs to perform one pre-factorized matrix solve at each time step, and DeepWarp is able to simulate large models in real time. Banner design for is challenging to clearly convey information while also satisfying aesthetic goals and complying with the banner owner or advertiser's visual identity system. In online advertising, banners are often born with tens of different display sizes and rapidly changing design styles to chase fashion in many distinct market areas and designers have to make huge efforts to adjust their designs for each display size and target style. Therefore, automating multi-size and multi-style banner design can greatly release designers' creativity. Different from previous work relying on a single unified omnipotent optimization to accomplish such a complex problem, we tackle it with a combination of layout style learning, interpolation and transfer. We optimize banner layout given the style parameter learned from a set of training banners for a particular display size and layout style. Such kind of optimization is faster and much more controllable than optimizing for all sizes and diverse styles. To achieve multi-size banner design, we collect style parameters for a small collection of various sizes and interpolate them to support arbitrary target size. To reduce the difficulty of style parameter training, we invent a novel style transfer technique so that creating a multi-size style becomes as easy as designing a single banner. With all of the three techniques described above, a robust and easy-to-use layout style model is built, upon which we automate the banner design. We test our method on a data set containing thousands of real banners for online advertising and evaluate our generated banners in various sizes and styles by comparing them with professional designs. While the 3D printing technology has become increasingly popular in recent years, it suffers from two critical limitations: expensive printing material and long printing time. An effective solution is to hollow the 3D model into a shell and print the shell by parts. Unfortunately, making shell pieces tightly assembled and easy to disassemble seem to be two contradictory conditions, and there exists no easy way to satisfy them at the same time yet. In this paper, we present a computational system to design an interlocking structure of a partitioned shell model, which uses only male and female connectors to lock shell pieces in the assembled configuration. Given a mesh segmentation input, our system automatically finds an optimal installation plan specifying both the installation order and the installation directions of the pieces, and then builds the models of the shell pieces using optimized shell thickness and connector sizes. To find the optimal installation plan, we develop simulation�\based and data�\driven metrics, and we incorporate them into an optimal plan search algorithm with fast pruning and local optimization strategies. The whole system is automatic, except for the shape design of the key piece. The interlocking structure does not introduce new gaps on the outer surface, which would become noticeable inevitably due to limited printer precision. Our experiment shows that the assembled object is strong against separation, yet still easy to disassemble. We propose an acoustic-VR system that converts acoustic signals of human language (Chinese) to realistic 3D tongue animation sequences in real time. It is known that directly capturing the 3D geometry of the tongue at a frame rate that matches the tongue's swift movement during the language production is challenging. This difficulty is handled by utilizing the electromagnetic articulography (EMA) sensor as the intermediate medium linking the acoustic data to the simulated virtual reality. We leverage Deep Neural Networks to train a model that maps the input acoustic signals to the positional information of pre-defined EMA sensors based on 1,108 utterances. Afterwards, we develop a novel reduced physics-based dynamics model for simulating the tongue's motion. Unlike the existing methods, our deformable model is nonlinear, volume-preserving, and accommodates collision between the tongue and the oral cavity (mostly with the jaw). The tongue's deformation could be highly localized which imposes extra difficulties for existing spectral model reduction methods. Alternatively, we adopt a spatial reduction method that allows an expressive subspace representation of the tongue's deformation. We systematically evaluate the simulated tongue shapes with real-world shapes acquired by MRI/CT. Our experiment demonstrates that the proposed system is able to deliver a realistic visual tongue animation corresponding to a user's speech signal. In this paper, we present an interactive system for mechanism modeling from multi-view images. Its key feature is that the generated 3D mechanism models contain not only geometric shapes but also internal motion structures: they can be directly animated through kinematic simulation. Our system consists of two steps: interactive 3D modeling and stochastic motion parameter estimation. At the 3D modeling step, our system is designed to integrate the sparse 3D points reconstructed from multi-view images and a sketching interface to achieve accurate 3D modeling of a mechanism. To recover the motion parameters, we record a video clip of the mechanism motion and adopt stochastic optimization to recover its motion parameters by edge matching. Experimental results show that our system can achieve the 3D modeling of a range of mechanisms from simple mechanical toys to complex mechanism objects. We present an approach to fabricate shell objects with thickness parameters, which are computed to maintain the user-specified structural stability. Given a boundary surface and user-specified external forces, we optimize the thickness parameters according to stress constraints to extrude the surface. Our approach mainly consists of two technical components: First, we develop a patch-based shell simulation technique to efficiently support the static simulation of extruded shell objects using finite element methods. Second, we analytically compute the derivative of stress required in the sensitivity analysis technique to turn the optimization into a sequential linear programming problem. 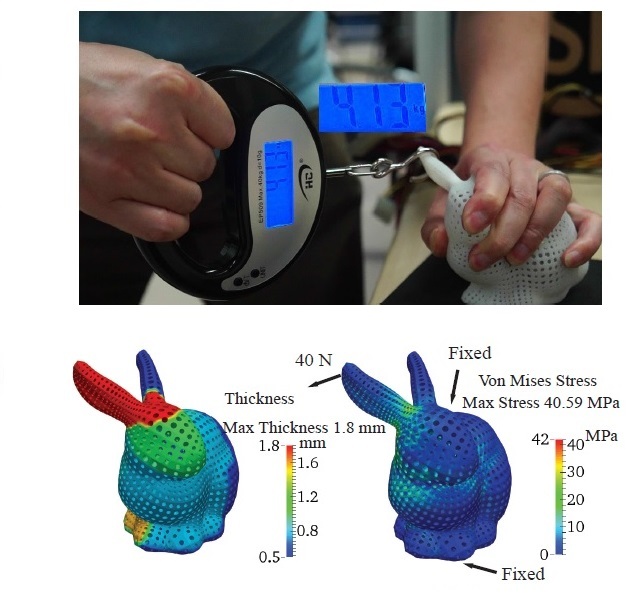 Experimental results demonstrate that our approach can optimize the thickness parameters for arbitrary surfaces in a few minutes and well predict the physical properties, such as the deformation and stress of the fabricated object. The polycube based hexahedralization methods are robust to the generation of internal singularity free all-hex meshes. They avoid the difficulty to control the global singularity structure for a valid hexahedralization in frame-field based methods. To thoroughly utilize this advantage, we propose to use a frame field without internal singularities to guide the polycube construction. Theoretically, our method extends the vector fields associated with the polycube from exact forms to closed forms, which are curl free everywhere but may not be globally integrable. The closed forms give additional degrees of freedom to deal with the topological structure of high genus models, and also provide better initial axis alignment for subsequent polycube generation. We demonstrate the advantages of our method on various models, ranging from genus-zero models to high genus ones, from single-boundary models to multiple boundary ones. A roly-poly toy is considered as one of the oldest toys in history. People, both young and old, are fascinated by its unique ability to right itself when pushed over. There exist different kinds of roly-poly toys with various shapes. Most of them share a similar bottom which is a hollow hemisphere with a weight inside. However, it is not an easy task to make an arbitrary model to swing like a roly-poly due to the delicate equilibrium condition between the center of mass of the roly-poly toy and the shape of the hemisphere. In this paper, we present a computer-aided method to help casual users design a personalized roly-poly toy and fabricate it through 3D printing with reduced material usage and sufficient stability. The effectiveness of our method is validated on various models. Our method provides a novel easy-to-use means to design an arbitrary roly-poly toy with an ordinary 3D printing machine, extricating amateurs from the dilemma of finding extra weight to balance the shape. Image compositing is widely used to combine visual elements from separate source images into a single image. Although recent image compositing techniques are capable of achieving smooth blending of the visual elements from different sources, most of them implicitly assume the source images are taken in the same viewpoint. In this paper, we present an approach to compositing novel image objects from multiple source images which have different viewpoints. Our key idea is to construct 3D proxies for meaningful components of the source image objects, and use these 3D component proxies to warp and seamlessly merge components together in the same viewpoint. To realize this idea, we introduce a coordinate-frame based single-view camera calibration algorithm to handle general types of image objects, a structure-aware cuboid optimization algorithm to get the cuboid proxies for image object components with correct structure relationship, and finally a 3D-proxy transformation guided image warping algorithm to stitch object components. 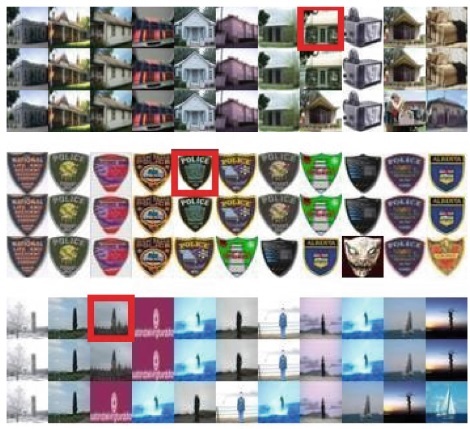 We further describe a novel application based on this compositing approach to automatically synthesize a large number of image objects from a set of exemplars. 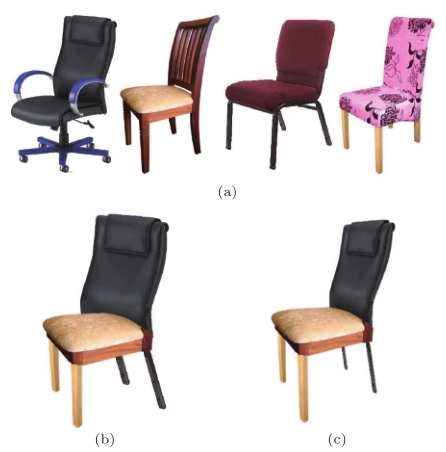 Experimental results show that our compositing approach can be applied to a variety of image objects, such as chairs, cups, lamps, and robots, and the synthesis application can create novel image objects with significant shape and style variations from a small set of exemplars. Recent years have witnessed growing interests in computing compact binary codes and binary visual descriptors to alleviate the heavy computational costs in large-scale visual research. However, it is still computationally expensive to linearly scan the large-scale databases for nearest neighbor (NN) search. In , a new approximate NN search algorithm is presented. With the concept of bridge vectors which correspond to the cluster centers in Product Quantization  and the augmented neighborhood graph, it is possible to adopt an extract-on-demand strategy on the online querying stage to search with priority. This paper generalizes the algorithm to the Hamming space with an alternative version of k-means clustering. Despite the simplicity, our approach achieves competitive performance compared to the state-of-the-art methods, i.e., MIH and FLANN, in the aspects of search precision, accessed data volume and average querying time. We present a lightweight non-parametric method to generate wrinkles for 3D facial modeling and animation. 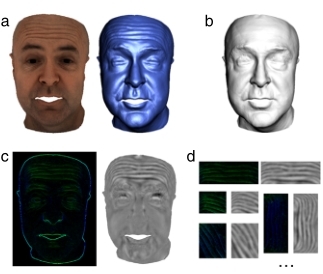 The key lightweight feature of the method is that it can generate plausible wrinkles using a single low-cost Kinect camera and one high quality 3D face model with details as the example. Our method works in two stages: (1) offline personalized wrinkled blendshape construction. User-specific expressions are recorded using the RGB-Depth camera, and the wrinkles are generated through example-based synthesis of geometric details. (2) Online 3D facial performance capturing. These reconstructed expressions are used as blendshapes to capture facial animations in real-time. Experiments on a variety of facial performance videos show that our method can produce plausible results, approximating the wrinkles in an accurate way. Furthermore, our technique is low-cost and convenient for common users. This paper presents an agile simulation-aided shape editing system for personal fabrication applications. The finite element structural analysis and geometric design are seamlessly integrated within our system to provide users interactive structure analysis feedback during mesh editing. Observing the fact that most editing operations are actually local, a domain decomposition framework is employed to provide unified interface for shape editing, FEM system updating and shape optimization. We parameterize entries of the stiffness matrix as polynomial-like functions of geometry editing parameters thus the underlying FEM system can be rapidly synchronized once edits are made. A local update scheme is devised to re-use the untouched parts of the FEM system thus a lot repetitive calculations are avoided. Our system can also perform shape optimizations to reduce high stresses in model while preserving the appearance of the model as much as possible. Experiments show our system provides users a smooth editing experience and accurate feedback. We present a user-friendly suggestive interface for sketch-based character posing. Our interface provides suggestive information on the sketching canvas in succession by combining image retrieval technique with 3D character posing, while the user is drawing. The system highlights the canvas region where the user should draw on and constrains the user's sketches in a reasonable solution space. This is based on an efficient image descriptor, which is used to measure the distance between the user's sketch and 2D views of 3D poses. In order to achieve faster query response, local sensitive hashing is involved in our system. 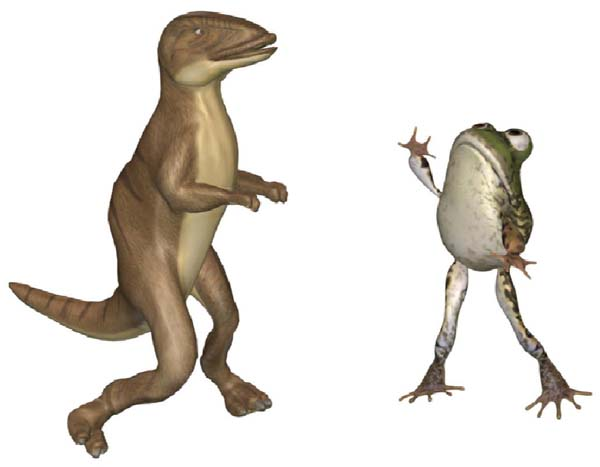 In addition, sampling-based optimization algorithm is adopted to synthesize and optimize the retrieved 3D pose to match the user's sketches the best. 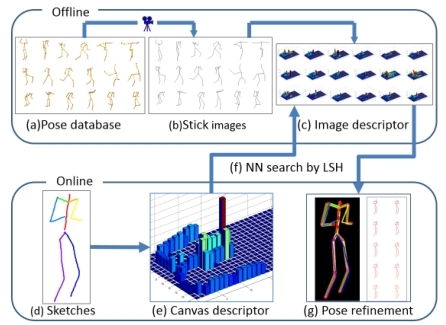 Experiments show that our interface can provide smooth suggestive information to improve the reality of sketching poses and shorten the time required for 3D posing. 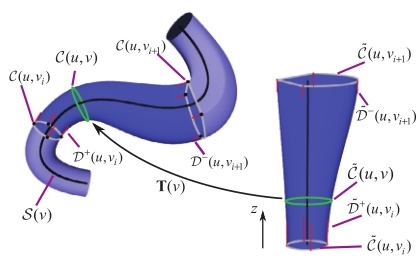 This paper presents a system for design and simulation of supporting tube structure. We model each freeform tube component as a swept surface, and employ boundary control and skeletal control to manipulate its cross-sections and its embedding respectively. With the parametrization of the swept surface, a quadrilateral mesh consisting of nine-node general shell elements is automatically generated and the stress distribution of the structure is simulated using the finite element method. In order to accelerate the complex finite element simulation, we adopt a two-level subspace simulation strategy, which constructs a secondary complementary subspace to improve the subspace simulation accuracy. Together with the domain decomposition method, our system is able to provide interactive feedback for parametric freeform tube editing. Experiments show that our system is able to predict the structural character of the tube structure efficiently and accurately. RGB Video now is one of the major data sources of traffic surveillance applications. In order to detect the possible traffic events in the video, traffic-related objects, such as vehicles and pedestrians, should be first detected and recognized. However, due to the 2D nature of the RGB videos, there are technical difficulties in efficiently detecting and recognizing traffic-related objects from them. For instance, the traffic-related objects cannot be efficiently detected in separation while parts of them overlap, and complex background will influence the accuracy of the object detection. In this paper, we propose a robust RGB-D data based traffic scene understanding algorithm. 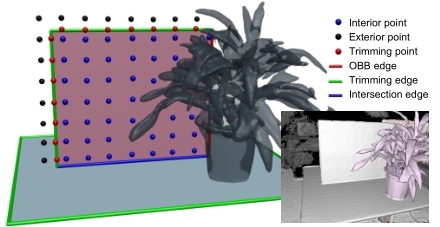 By integrating depth information, we can calculate more discriminative object features and spatial information can be used to separate the objects in the scene efficiently. Experimental results show that integrating depth data can improve the accuracy of object detection and recognition. We also show that the analyzed object information plus depth data facilitate two important traffic event detection applications: overtaking warning and collision avoidance. Image-based object recognition is employed widely in many computer vision applications such as image semantic annotation and object location. 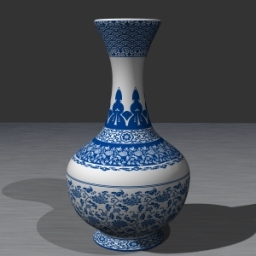 However, traditional object recognition algorithms based on the 2D features of RGB data have difficulty when objects overlap and image occlusion occurs. At present, RGB-D cameras are being used more widely and the RGB-D depth data can provide auxiliary information to address these challenges. In this study, we propose a deep learning approach for the efficient recognition of 3D objects with occlusion. 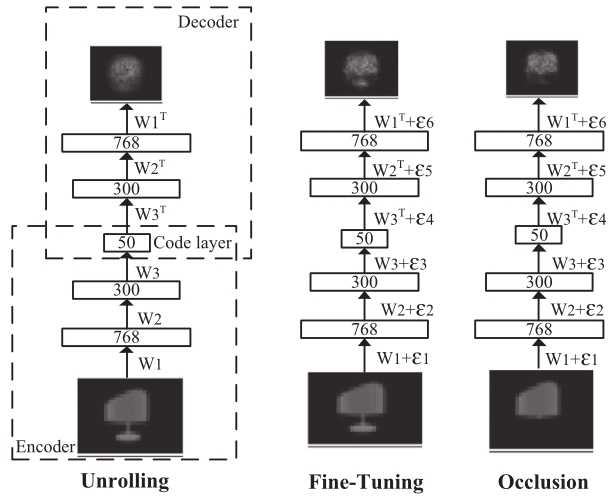 First, this approach constructs a multi-view shape model based on 3D objects by using an encode�Cdecode deep learning network to represent the features. 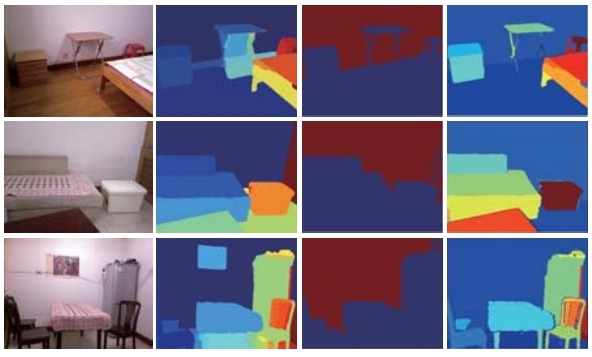 Next, 3D object recognition in indoor scenes is performed using random forests. The application of deep learning to RGB-D data is beneficial for recovering missing information due to image occlusion. Our experimental results demonstrate that this approach can significantly improve the efficiency of feature representation and the performance of object recognition with occlusion. 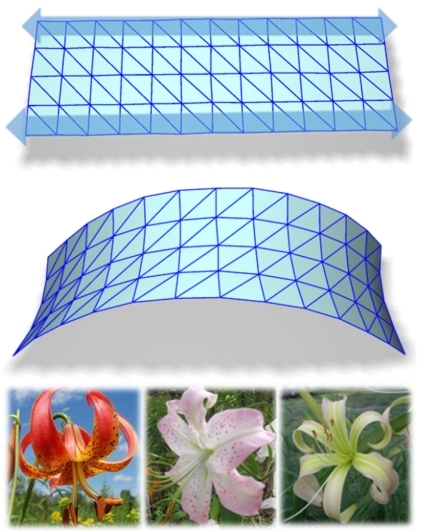 This paper presents a new physics-based simulation method for flower blossom, which is based on biological observations that flower opening is usually driven by a boundary-dominant morphological transition in a curved petal. We use an elastic triangular mesh representing a flower petal and adopt in-plane expansion to induce global bending. Out-of-plane curl plays an auxiliary role in reducing the curvatures of cross-sections. We also propose to adapt semi-implicit Euler time integrator for fast simulation results, which has intrinsic damping and at least one order precision. Our system allows users to control the blossoming process by simply specifying a growth curve, which is easy to design because of the boundary-dominant property. Experimental results show that our physics-based system runs faster and generates more realistic and convincing blossom results than the existing simulation methods. Copyright ? 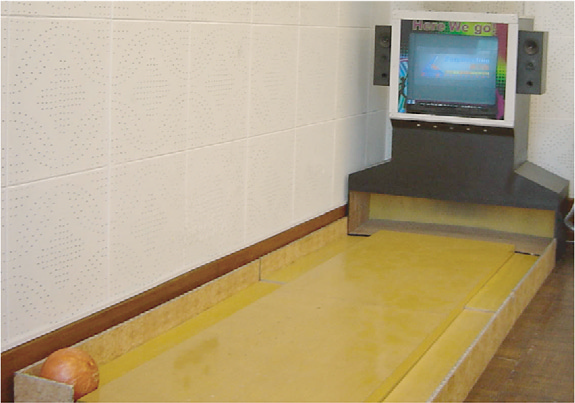 2015 John Wiley & Sons, Ltd.
We propose a real-time approach for indoor scene reconstruction. It is capable of producing a ready-to-use 3D geometric model even while the user is still scanning the environment with a consumer depth camera. Our approach features explicit representations of planar regions and nonplanar objects extracted from the noisy feed of the depth camera, via an online structure analysis on the dynamic, incomplete data. The structural information is incorporated into the volumetric representation of the scene, resulting in a seamless integration with KinectFusion's global data structure and an efficient implementation of the whole reconstruction process. Moreover, heuristics based on rectilinear shapes in typical indoor scenes effectively eliminate camera tracking drift and further improve reconstruction accuracy. The instantaneous feedback enabled by our on-the-fly structure analysis, including repeated object recognition, allows the user to selectively scan the scene and produce high-fidelity large-scale models efficiently. We demonstrate the capability of our system with real-life examples. Model reduction has popularized itself for simulating elastic deformation for graphics applications. While these techniques enjoy orders-of-magnitude speedups at runtime simulation, the efficiency of precomputing reduced subspaces remains largely overlooked. We present a complete system of precomputation pipeline as a faster alternative to the classic linear and nonlinear modal analysis. We identify three bottlenecks in the traditional model reduction precomputation, namely modal matrix construction,cubature training, and training dataset generation, and accelerate each of them. 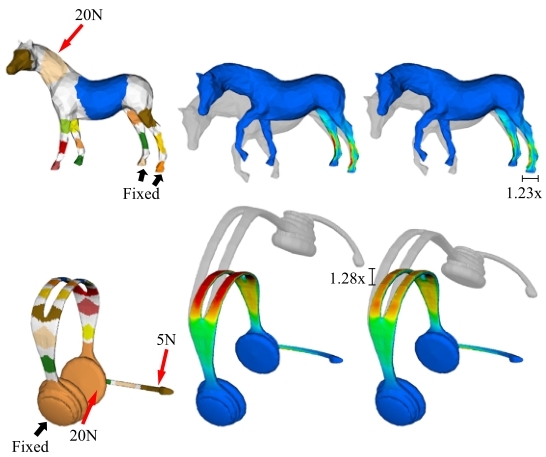 Even with complex deformable models, our method has achieved orders-of-magnitude speedups over the traditional precomputation steps, while retaining comparable runtime simulation quality. 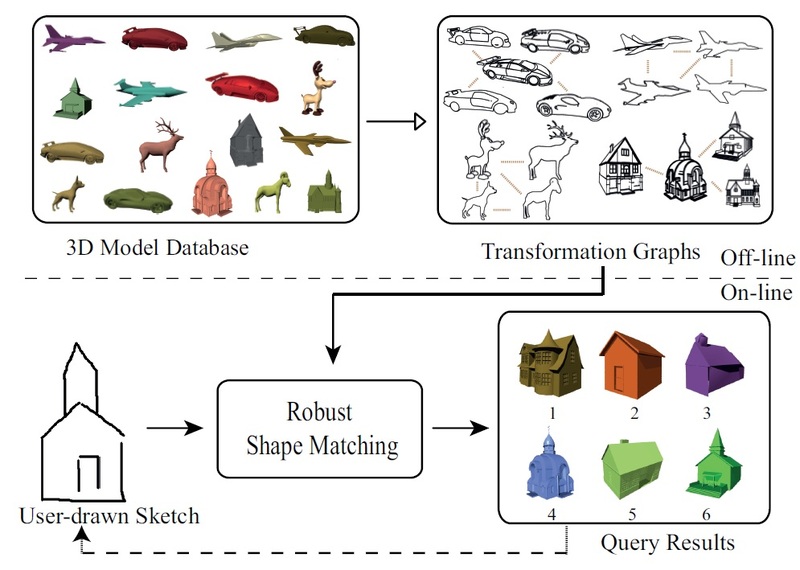 We propose a transductive shape segmentation algorithm, which can transfer prior segmentation results in database to new shapes without explicitly specification of prior category information. Our method first partitions an input shape into a set of segmentations as a data preparation, and then a linear integer programming algorithm is used to select segments from them to form the final optimal segmentation. The key idea is to maximize the segment similarity between the segments in the input shape and the segments in database, where the segment similarity is computed through sparse reconstruction error. The segment-level similarity enables to handle a large amount of shapes with significant topology or shape variations with a small set of segmented example shapes. Experimental results show that our algorithm can generate high quality segmentation and semantic labeling results in the Princeton segmentation benchmark. Since indoor scenes are frequently changed in daily life, such as re-layout of furniture, the 3D reconstructions for them should be flexible and easy to update. We present an automatic 3D scene update algorithm to indoor scenes by capturing scene variation with RGBD cameras. We assume an initial scene has been reconstructed in advance in manual or other semi-automatic way before the change, and automatically update the reconstruction according to the newly captured RGBD images of the real scene update. It starts with an automatic segmentation process without manual interaction, which benefits from accurate labeling training from the initial 3D scene. After the segmentation, objects captured by RGBD camera are extracted to form a local updated scene. We formulate an optimization problem to compare to the initial scene to locate moved objects. The moved objects are then integrated with static objects in the initial scene to generate a new 3D scene. We demonstrate the efficiency and robustness of our approach by updating the 3D scene of several real-world scenes. Inverse shape design for elastic objects greatly eases the design efforts by letting users focus on desired target shapes without thinking about elastic deformations. Solving this problem using classic iterative methods (e.g., Newton-Raphson methods), however, often suffers from slow convergence toward a desired solution. In this paper, we propose an asymptotic numerical method that exploits the underlying mathematical structure of specific nonlinear material models, and thus runs orders of magnitude faster than traditional Newton-type methods. We apply this method to compute rest shapes for elastic fabrication, where the rest shape of an elastic object is computed such that after physical fabrication the real object deforms into a desired shape. We illustrate the performance and robustness of our method through a series of elastic fabrication experiments. Missing data due to occlusion is a key challenge in 3D acquisition, particularly in cluttered man-made scenes. Such partial information about the scenes limits our ability to analyze and understand them. In this work we abstract such environments as collections of cuboids and hallucinate geometry in the occluded regions by globally analyzing the physical stability of the resultant arrangements of the cuboids. Our algorithm extrapolates the cuboids into the un-seen regions to infer both their corresponding geometric attributes (e.g., size, orientation) and how the cuboids topologically interact with each other (e.g., touch or fixed). The resultant arrangement provides an abstraction for the underlying structure of the scene that can then be used for a range of common geometry processing tasks. We evaluate our algorithm on a large number of test scenes with varying complexity, validate the results on existing benchmark datasets, and demonstrate the use of the recovered cuboid-based structures towards object retrieval, scene completion, etc. We present a real-time solution for generating detailed clothing deformations from pre-computed clothing shape examples. 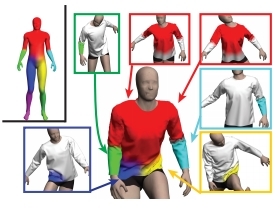 Given an input pose, it synthesizes a clothing deformation by blending skinned clothing deformations of nearby examples controlled by the body skeleton. Observing that cloth deformation can be well modeled with sensitivity analysis driven by the underlying skeleton, we introduce a sensitivity based method to construct a pose-dependent rigging solution from sparse examples. We also develop a sensitivity based blending scheme to find nearby examples for the input pose and evaluate their contributions to the result. Finally, we propose a stochastic optimization based greedy scheme for sampling the pose space and generating example clothing shapes. Our solution is fast, compact and can generate realistic clothing animation results for various kinds of clothes in real time. Widely used for morphing between objects with arbitrary topology, distance field interpolation (DFI) handles topological transition naturally without the need for correspondence or remeshing, unlike surface-based interpolation approaches. However, lack of correspondence in DFI also leads to ineffective control over the morphing process. In particular, unless the user specifies a dense set of landmarks, it is not even possible to measure the distortion of intermediate shapes during interpolation, let alone control it. To remedy such issues, we introduce an approach for establishing correspondence between the interior of two arbitrary objects, formulated as an optimal mass transport problem with a sparse set of landmarks. This correspondence enables us to compute non-rigid warping functions that better align the source and target objects as well as to incorporate local rigidity constraints to perform as-rigid-as�rpossible DFI. 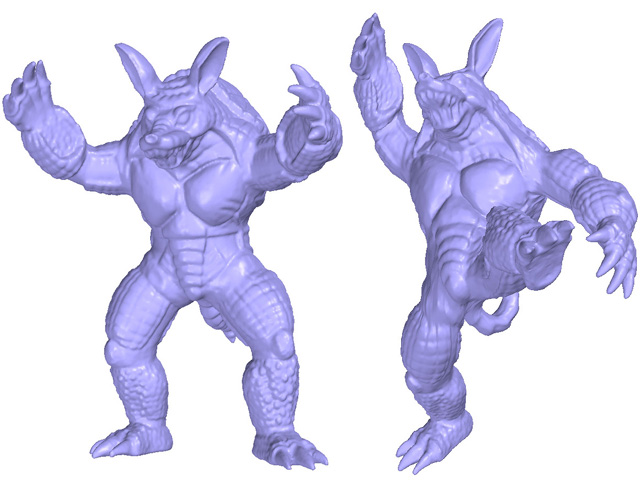 We demonstrate how our approach helps achieve flexible morphing results with a small number of landmarks. Concept sketches are popularly used by designers to convey pose and function of products. Understanding such sketches, however, requires special skills to form a mental 3D representation of the product geometry by linking parts across the different sketches and imagining the intermediate object configurations. Hence, the sketches can remain inaccessible to many, especially non-designers. We present a system to facilitate easy interpretation and exploration of concept sketches. Starting from crudely specified incomplete geometry, often inconsistent across the different views, we propose a globally-coupled analysis to extract part correspondence and inter-part junction information that best explain the different sketch views. The user can then interactively explore the abstracted object to gain better understanding of the product functions. Our key technical contribution is performing shape analysis without access to any coherent 3D geometric model by reasoning in the space of inter-part relations. We evaluate our system on various concept sketches obtained from popular product design books and websites. In this paper, we propose a novel framework for multidomain subspace deformation using node-wise corotational elasticity. With the proper construction of subspaces based on the knowledge of the boundary deformation, we can use the Lagrange multiplier technique to impose coupling constraints at the boundary without overconstraining. In our deformation algorithm, the number of constraint equations to couple two neighboring domains is not related to the number of the nodes on the boundary but is the same as the number of the selected boundary deformation modes. The crack artifact is not present in our simulation result, and the domain decomposition with loops can be easily handled. Experimental results show that the single-core implementation of our algorithm can achieve real-time performance in simulating deformable objects with around quarter million tetrahedral elements. We introduce a new method to synthesize mechanical toys solely from the motion of their features. The designer specifies the geometry and a time-varying rotation and translation of each rigid feature component. Our algorithm automatically generates a mechanism assembly located in a box below the feature base that produces the specified motion. Parts in the assembly are selected from a parameterized set including belt-pulleys, gears, crank-sliders, quick-returns, and various cams (snail, ellipse, and double-ellipse). Positions and parameters for these parts are optimized to generate the specified motion, minimize a simple measure of complexity, and yield a well-distributed layout of parts over the driving axes. Our solution uses a special initialization procedure followed by simulated annealing to efficiently search the complex configuration space for an optimal assembly. We present an interactive approach to semantic modeling of indoor scenes with a consumer-level RGBD camera. Using our approach, the user first takes a RGBD image of an indoor scene, which is automatically segmented into a set of regions with semantic labels. If the segmentation is not satisfactory, the user can draw some strokes to guide the algorithm to achieve better results. After the segmentation is finished, the depth data of each semantic region is used to retrieve a matching 3D model from a database. Each model is then transformed according to the image depth to yield the scene. For large scenes where a single image can only cover one part of the scene, the user can take multiple images to construct other parts of the scene. 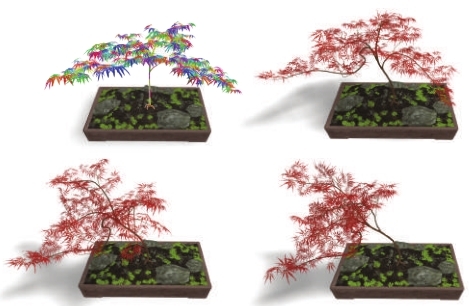 The 3D models built for all images are then transformed and unified into a complete scene. We demonstrate the efficiency and robustness of our approach by modeling several real-world scenes. Decomposing a volume into high-quality hexahedral cells is a challenging task in geometric modeling and computational geometry. Inspired by the use of cross field in quad meshing and the CubeCover approach in hex meshing, we present a complete all-hex meshing framework based on singularity-restricted field that is essential to induce a valid all-hex structure. Given a volume represented by a tetrahedral mesh, we first compute a boundary-aligned 3D frame field inside it, then convert the frame field to be singularity-restricted by our effective topological operations. In our all-hex meshing framework, we present an enhanced CubeCover approach that reduces degenerate elements appearing in the volume parameterizations via tetrahedral split operations and handle flipped elements effectively in hex-mesh extraction. Experimental results show that our algorithm generates high-quality all-hex meshes from a variety of 3D volumes robustly and efficiently. We introduce a vector representation called diffusion curve tex-tures for mapping diffusion curve images (DCI) onto arbitrary surfaces. In contrast to the original implicit representation of DCIs [Orzan et al. 2008], where determining a single texture value requires iterative computation of the entire DCI via the Poisson equation, diffusion curve textures provide an explicit representa-tion from which the texture value at any point can be solved di-rectly, while preserving the compactness and resolution indepen-dence of diffusion curves. This is achieved through a formulation of the DCI diffusion process in terms of Green’s functions. This formulation furthermore allows the texture value of any rectangular region (e.g. pixel area) to be solved in closed form, which facilitates anti-aliasing. We develop a GPU algorithm that renders anti-aliased diffusion curve textures in real time, and demonstrate the effective-ness of this method through high quality renderings with detailed control curves and color variations. 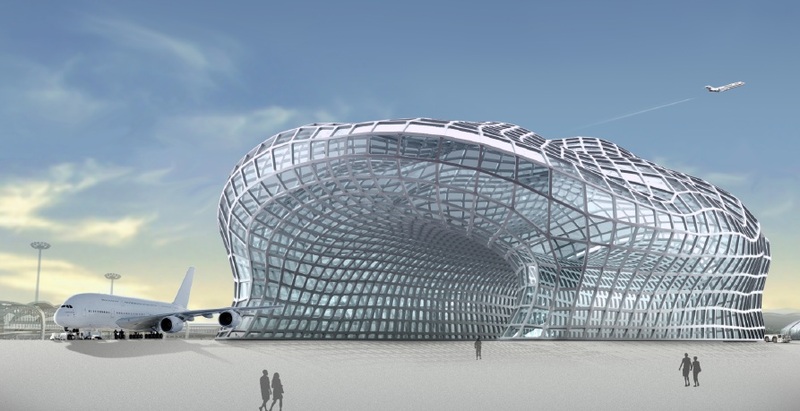 We present a novel method to approximate a freeform shape with a planar quadrilateral (PQ) mesh for modeling architectural glass structures. Our method is based on the study of conjugate direction fields (CDF) which allow the presence of k/4 singularities. Starting with a triangle discretization of a freeform shape, we first compute an as smooth as possible conjugate direction field satisfying the user’s directional and angular constraints, then apply mixed-integer quadrangulation and planarization techniques to generate a PQ mesh which approximates the input shape faithfully. 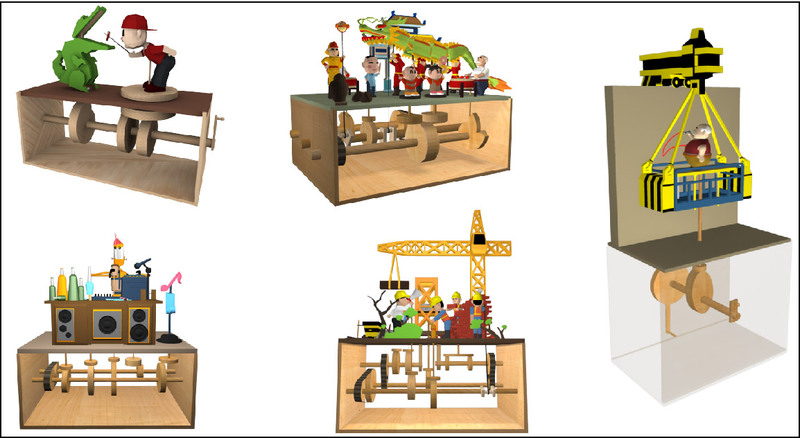 We demonstrate that our method is effective and robust on various 3D models. We propose a sketch-based 3D shape retrieval system that is substantially more discriminative and robust than existing systems, especially for complex models. The power of our system comes from a combination of a contourbased 2D shape representation and a robust sampling-based shape matching scheme. They are defined over discriminative local features and applicable for partial sketches; robust to noise and distortions in hand drawings; and consistent when strokes are added progressively. However, our robust shape matching algorithm requires dense sampling and registration, which incurs a high computational cost. We thus devise critical acceleration methods to achieve interactive performance: precomputing kNN graphs that record transformations between neighboring contour images and enable fast online shape alignment; pruning sampling and shape registration strategically and hierarchically; and parallelizing shape matching on multi-core platforms or GPUs. We demonstrate the effectiveness of our system through various experiments, comparisons, and a user study. 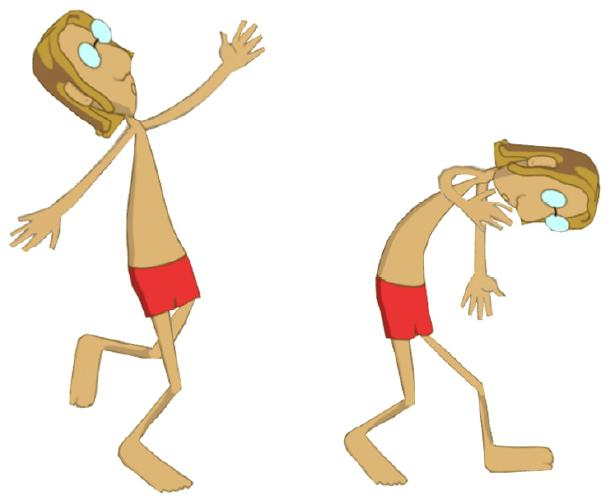 Human motions are the product of internal and external forces, but these forces are very difficult to measure in a general setting. Given a motion capture trajectory, we propose a method to reconstruct its open-loop control and the implicit contact forces. The method employs a strategy based on randomized sampling of the control within user-specified bounds, coupled with forward dynamics simulation. Sampling-based techniques are well suited to this task because of their lack of dependence on derivatives, which are difficult to estimate in contact-rich scenarios. They are also easy to parallelize, which we exploit in our implementation on a compute cluster. 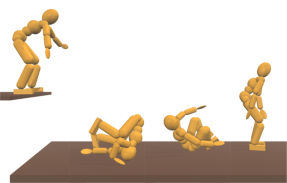 We demonstrate reconstruction of a diverse set of captured motions, including walking, running, and contact rich tasks such as rolls and kip-up jumps. 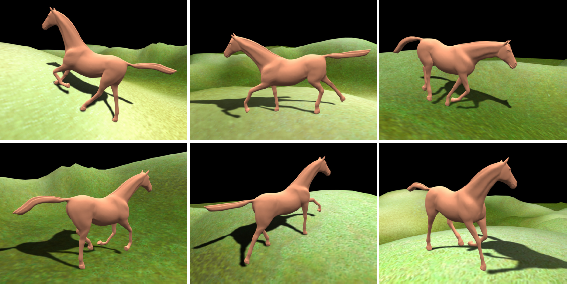 We further show how the method can be applied to physically based motion transformation and retargeting, physically plausible motion variations, and reference trajectory-free idling motions. Alongside the successes, we point out a number of limitations and directions for future work. We present a simple and effective algorithm to transfer deformation between surface meshes with multiple components. The algorithm automatically computes spatial relationships between components of the target object, builds correspondences between source and target, and finally transfers deformation of the source onto the target while preserving cohesion between the target’s components. We demonstrate the versatility of our approach on various complex models. Complex mesh models of man-made objects often consist of multiple components connected by various types of joints. We propose a joint-aware deformation framework that supports the direct manipulation of an arbitrary mix of rigid and deformable components. We apply slippable motion analysis to automatically detect multiple types of joint constraints that are implicit in model geometry. 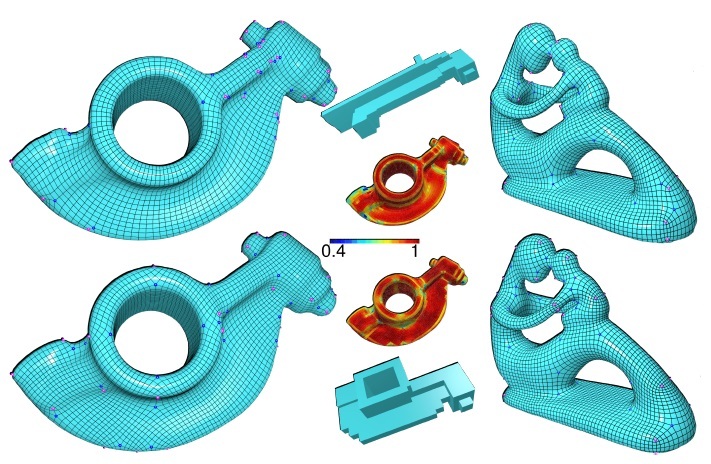 For single-component geometry or models with disconnected components, we support user-defined virtual joints. We integrate manipulation handle constraints, multiple components, joint constraints, joint limits, and deformation energies into a single volumetric-cell based space deformation problem. An iterative, parallelized Gauss-Newton solver is used to solve the resulting non-linear optimization. Interactive deformable manipulation is demonstrated on a variety of geometric models while automatically respecting their multi-component nature and the natural behavior of their joints. This paper presents a novel deformation system for video objects. The system is designed to minimize the amount of user interaction, while providing flexible and precise user control. It has a keyframe-based user interface. The user only needs to manipulate the video object at some keyframes. Our algorithm will smoothly propagate the editing result from the keyframes to the rest frames and automatically generate the new video object. The algorithm is able to preserve the temporal coherence as well as the shape features of the video objects in the original video clips. Weiwei Xu, Kun Zhou, Yizhou Yu, Qifeng Tan, Qunsheng Peng, Baining Guo. Many graphics applications, including computer games and 3D animated films, make heavy use of deforming mesh sequences. In this paper, we generalize gradient domain editing to deforming mesh sequences. Our framework is keyframe based. Given sparse and irregularly distributed constraints at unevenly spaced keyframes, our solution first adjusts the meshes at the keyframes to satisfy these constraints, and then smoothly propagate the constraints and deformations at keyframes to the whole sequence to generate new deforming mesh sequence. To achieve convenient keyframe editing, we have developed an efficient alternating least-squares method. It harnesses the power of subspace deformation and two-pass linear methods to achieve high-quality deformations. We have also developed an effective algorithm to define boundary conditions for all frames using handle trajectory editing. Our deforming mesh editing framework has been successfully applied to a number of editing scenarios with increasing complexity, including footprint editing, path editing, temporal filtering, handle-based deformation mixing, and spacetime morphing. Kun Zhou, Xin Huang, Weiwei Xu, Baining Guo. We present an algorithm for interactive deformation of subdivision surfaces, including displaced subdivision surfaces and subdivision surfaces with geometric textures. Our system lets the user directly manipulate the surface using freely-selected surface points as handles. During deformation the control mesh vertices are automatically adjusted such that the deforming surface satisfies the handle position constraints while preserving the original surface shape and details. 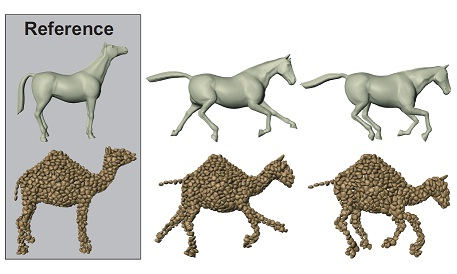 To best preserve surface details, we develop a gradient domain technique that incorporates the handle position constraints and detail preserving objectives into the deformation energy. 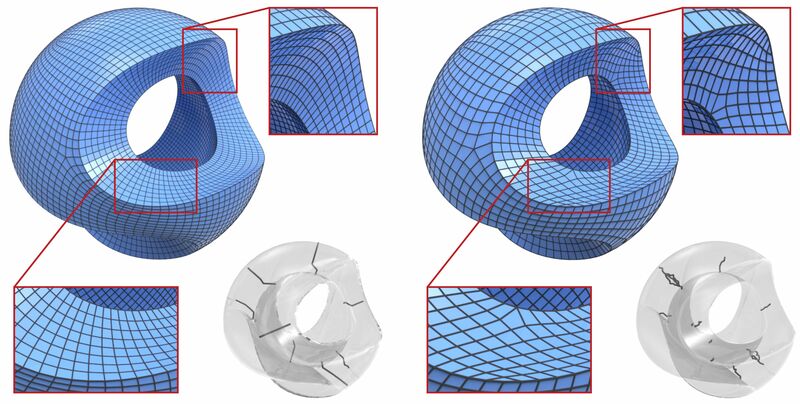 For displaced subdivision surfaces and surfaces with geometric textures, the deformation energy is highly nonlinear and cannot be handled with existing iterative solvers. To address this issue, we introduce a shell deformation solver, which replaces each numerically unstable iteration step with two stable mesh deformation operations. Our deformation algorithm only uses local operations and is thus suitable for GPU implementation. The result is a real-time deformation system running orders of magnitude faster than the state-of-the-art multigrid mesh deformation solver. We demonstrate our technique with a variety of examples, including examples of creating visually pleasing character animations in real-time by driving a subdivision surface with motion capture data. Permission to make digital or hard copies of part or all of this work for personal or classroom use is granted without fee provided that copies are not made or distributed for profit or commercial advantage and that copies bear this notice and the full citation on the first page. Copyrights for components of this work owned by others than ACM must be honored. Abstracting with credit is permitted. To copy otherwise, to republish, to post on servers, or to redistribute to lists, requires prior specific permission and/or a fee. Request permissions from Publications Dept, ACM Inc., fax +1 (212) 869-0481, or permissions@acm.org. The definitive version of this paper can be found at ACM’s Digital Library --http://www.acm.org/dl/.